The North Atlantic right whale weighs up to 100,000 kg (220,000 lb) and is up to 17 m (56') long. It can easily be distinguished from the other great whales by its lack of a dorsal fin or dorsal ridge; its stout, robust stature; and the presence of distinctive growths on the head known as "callosities". Right whales are individually identifiable by their pattern of callosities. The right whale is usually found in temperate waters. It is found closer to land than are most large whales, especially during the breeding season. Calves may be born in the protected waters of a shallow bay. The North Atlantic right whale feeds alone or in small groups. Its food consists primarily of small marine crustaceans. Right whales are " skim feeders", moving slowly through the water with their mouths partially open, continuously straining the food items with their long baleen. The North Atlantic right whale migrates to more northerly latitudes for summer feeding, and back south to temperate waters in the fall and winter for breeding. A relatively slow swimmer, the North Atlantic right whale averages about 8 km/h (6 mi/h). It usually does not fear boats and can be easily approached by them. North Atlantic right whales usually travel alone or in groups of 2 - 3 (up to about 12). The membership of groups of right whales does not seem to remain fixed. Identifiable individuals can be seen moving from one group to another. An individual female mates with multiple males. Apparently, mating pairs do not establish long-term social bonds. The North Atlantic right whale occurs in the Atlantic Ocean: during the summer from Davis Strait, Denmark Strait, and the Norwegian Sea south to Massachusetts and the Bay of Biscay; during the winter it ranges south to Florida and the Golfo de Cintra (23°N), Western Sahara. The species is close to extinction in the Eastern North Atlantic. Overfishing by the whaling industry caused the North Atlantic right whale's decline. Its most serious threats are collisions with ships and entanglement in fishing gear. More than half of the living right whales in the Western North Atlantic have experienced at least one ship-strike or net entanglement. *** The North Atlantic right whale is one of the world's rarest mammals. 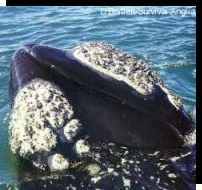 *** Female right whales have a very strong protective maternal instinct. This was taken advantage of by early whalers, who captured the calf first, knowing that the mother was then unlikely to escape. *** Right whales were so named because they were the "right" whale to hunt: they are slow; they float when killed; they are found in temperate waters; and they have a high yield of oil. 2004: Occurs in Bahamas, Belgium, Canada, France, Germany, Iceland, Ireland, Italy, Mexico, Morocco, Netherlands, Portugal, Spain, United Kingdom, and United States (IUCN 2004). 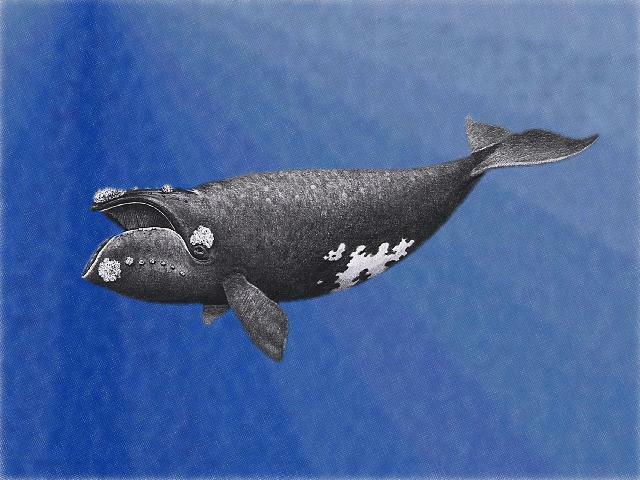 The North Atlantic right whale was once abundant and distributed throughout the North Atlantic. It was hunted starting in the 10th - 11th centuries. Catches peaked between the 13th - 17th centuries but continued, at a low level, into the 20th century. By 1700 it was too rare to be of economic importance. In addition, because the North Atlantic right whale is dependent on coastal habitat, it may be more vulnerable to impacts from human activity, such as pollution, than many other cetaceans. Furthermore, because the population is so small and slow-growing, even minor sources of mortality may have a significant impact. Length: 13 - 17 m (43 - 56'); Weight: 60,000 - 100,000 kg (130,000 - 220,000 lb). The North Atlantic right whale is usually found in temperate waters, although some move just north of the Arctic Circle or just south of the Tropic of Cancer. It is found closer to land than are most large whales, especially during the breeding season. Calves may be born in the protected waters of a shallow bay. Between 9 - 12 months. A single calf is born at a time. Females give birth every 3 - 4 years (Wilson & Ruff 1999) . The North Atlantic right whale migrates to more northerly latitudes for summer feeding, and back south to temperate waters in the fall and winter for breeding. It is a relatively slow swimmer, averaging about 8 km/h (6 mi/h). It usually makes a series of 5 or 6 shallow dives and then submerges for about 20 minutes. It usually does not fear boats and can be easily approached by them. Right whales emit a number of low frequency sounds, mostly during courtship. Breaching behavior and lobtailing are common in this species. North Atlantic right whales usually travel alone or in groups of 2 - 3 (up to about 12). When they were more numerous, groups of up to 100 were seen together on the feeding grounds. If prey are dense, the whales may feed together, although usually the groups break up to feed individually, probably because of the enormous food requirements of each individual whale. The membership of groups of right whales does not seem to remain fixed. Identifiable individuals can be seen moving from one group to another. A calf and its mother appear to exhibit the same type of bonding behavior that is typical of other mammals. The calf maintains close contact with its mother, swimming up on her back or butting her with its head. The mother may roll over on her back and hold her calf in her flippers. An individual female mates with multiple males. Apparently, mating pairs do not establish long-term social bonds. Known mortality amounted to less than 1 whale per year in the 1970's (Reeves 1982) .